Comments Off on Pumpkin Carving Secrets Revealed! If you have always wanted to carve the Best Pumpkin in the World you can get in on the action with this book. 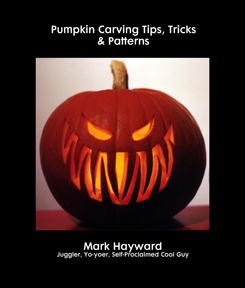 Mark Hayward has just released his first eBook: Pumpkin Carving Tips, Tricks and Patterns. Even if you don’t want to be the Best in the World and just want to carve a better pumpkin than last year, you should check this out. It’ll be the best $2 you ever spend on Halloween for something that wasn’t covered in chocolate. A lot of work went in to putting together this first edition of Pumpkin Carving Tips, Tricks and Patterns, and the second edition will be out in time for Halloween next year. The book was written as an enhanced version of Mark’s pumpkin web page. Mark Hayward Is My Hero is powered by	WordPress 5.1.1 and delivered to you in 0.433 seconds using 39 queries.